F. Sherman, Getting Started with Yeast. F. Sherman and J. Hicks, Micromanipulation and Dissection of Asci. F. Sherman and P. Wakem, Mapping Yeast Genes. S.L. Gerring, C. Connelly, and P. Hieter, Positional Mapping of Genes by Chromosome Blotting and Chromosome Fragmentation. G.F. Sprague, Jr., Assay of Yeast Mating Reaction. Y. Kassir and G. Simchen, Monitoring Meiosis and Sporulation in Saccharomyces cerevisiae. R.E. Esposito, M. Dresser, and M. Breitenbach, Identifying Sporulation Genes, Visualizing Synaptonemal Complexes, and Large-Scale Spore and Spore Wall Purification. I. Herskowitz and R.E. Jensen, Putting the HO Gene to Work: Practical Uses for Mating-Type Switching. B. Rockmill, E.J. Lambie, and G.S. Roeder, Spore Enrichment. T.D. Fox, L.S. Folley, J.J. Mulero, T.W. McMullin, P.E. Thorsness, L.O. Hedin, and M.C. Costanzo, Analysis and Manipulation of Yeast Mitochondrial Genes. P. Philippsen, A. Stotz, and C. Scherf, DNA of Saccharomyces cerevisiae. D.M. Becker and L. Guarente, High-Efficiency Transformation of Yeast by Electroporation. J.A. Heinemann and G.F. Sprague, Jr., Transmission of Plasmid DNA to Yeast by Conjugation with Bacteria. M.D. Rose and J.R. Broach, Cloning Genes by Complementation in Yeast. R.A. Young and R.W. Davis, Gene Isolation with ~glgt11 System. J. Rine, Gene Overexpression in Studies of Saccharomyces cerevisiae. D.T. Burke and M.V. Olson, Preparation of Clone Libraries in Yeast Artificial-Chromosome Vectors. C.W. Lawrence, Classical Mutagenesis Techniques. R. Rothstein, Targeting, Disruption, Replacement, and Allele Rescue. Integrative DNA Transformation in Yeast. R.S. Sikorski and J.D. Boeke, In Vitro Mutagenesis and Plasmid Shuffling. From Cloned Gene to Mutant Yeast. J.N. Strathern and D.R. Higgins, Recovery of Plasmids from Yeast into Escherichia coli Shuttle Vectors. M.F. Hoekstra, H.S. Seifert, J. Nickoloff, and F. Heffron, Shuttle Mutagenesis. D.J. Garfinkel and J.N. Strathern, Ty Mutagenesis in Saccharomyces cerevisiae. R.P. Moerschell, G. Das, and F. Sherman, Transformation of Yeast Directly with Synthetic Oligonucleotides. J.C. Schneider and L. Guarente, Vectors for Expression of Cloned Genes in Yeast. Regulation, Overproduction, and Underproduction. M. Schena, D. Picard, and K.R. Yamamoto, Vectors for Constitutive and Inducible Gene Expression in Yeast. K. Kadohrer and H. Domdey, Preparation of High Molecular Weight RNA. J.A. Wise, Preparation and Analysis of Low Molecular Weight RNAs and Small Ribonucleoproteins. R. Parker, D. Herrick, S.W. Peltz, and A. Jacobson, Measurement of mRNA Decay Rates in Saccharomyces cerevisiae. J.R. Warner, Labeling of RNA and Phosphoproteins in Saccharomyces cerevisiae. E.W. Jones, Tackling the Protease Problem in Saccharomyces cerevisiae. H.A. Rauaae, W.H. Mager, and R.J. Planta, Structural and Functional Analysis of Yeast Ribosomal Proteins. T.J. Koerner, J.E. Hill, A.M. Myers, and A. Tzagoloff, High-Expression Vectors with Multiple Cloning Sites for Construction of trpE Fusion Genes: pATH Vectors. D.T. Moir and L.S. Davidow, Production of Proteins by Secretion from Yeast. P.A. Kolodziej and R.A. Young, Epitope Tagging and Protein Surveillance. K. Struhl, Reverse Biochemistry: Methods and Applications for Synthesizing Yeast Proteins in Vitro. M.J. Leibowitz, F.P. Barbone, and D.E. Georgopoulos, In Vitro Protein Synthesis. N.F. Lue, P.M. Flanagan, R.J. Kelleher III, A.M. Edwards, and R.D. Kornberg, RNA Polymerase II Transcription in Vitro. J.M. Huibregtse and D.R. Engelke, Direct Sequence and Footprint Analysis of Yeast DNA by Primer Extension. J.R. Pringle, A.E.M. Adams, D.G. Drubin, and B.K. Haarer, Immunofluorescence Methods for Yeast. B. Byers and L. Goetsch, Preparation of Yeast Cells for Thin-Section Electron Microscopy. M.W. Clark, Immunogold Labeling of Yeast Ultrathin Sections. M.P. Yaffe, Analysis of Mitochondrial Function and Assembly. C.J. Roberts, C.K. Raymond, C.T. Yamashiro, and T.H. Stevens, Methods for Studying the Yeast Vacuole. A. Franzusoff, J. Rothblatt, and R. Schekman, Analysis of Polypeptide Transit through Yeast Secretory Pathway. P.D. Garcia, W. Hansen, and P. Walter, In Vitro Protein Translocation across Microsomal Membranes of Saccharomyces cerevisiae. P. Orlean, M.J. Kuranda, and C.F. Albright, Analysis of Glycoproteins from Saccharomyces cerevisiae. V. Dulic, M. Egerton, I. Elguindi, S. Raths, B. Singer, and H. Riezman, Yeast Endocytosis Assays. C.M. Nicolet and E.A. Craig, Inducing and Assaying Heat-Shock Response in Saccharomyces cerevisiae. M.W. Clark, Nucleolar-Specific Positive Stains for Optical and Electron Microscopy. A.E.M. Adams and J.R. Pringle, Staining of Actin with Fluorochrome-Conjugated Phalloidin. J.R. Pringle, Staining of Bud Scars and Other Cell Wall Chitin with Calcofluor. J.P. Aris and G. Blobel, Isolation of Yeast Nuclei. J.H. Shero, M. Koval, F. Spencer, R.E. Palmer, P. Hieter, and D. Koshland, Analysis of Chromosome Segregation in Saccharomyces cerevisiae. V. Berlin, J.A. Brill, J. Trueheart, J.D. Boeke, and G.R. Fink, Genetic Screens and Selections for Cell and Nuclear Fusion Mutants. S. Moreno, A. Klar, and P. Nurse, Molecular Genetic Analysis of Fission Yeast Schizosaccharomyces pombe. R.K. Mortimer, D. Schild, C.R. Contopoulou, and J.A. Kans, Genetic and Physical Maps of Saccharomyces cerevisiae. Each chapter includes references. Author Index. Subject Index. 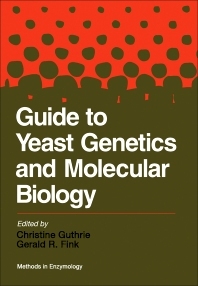 Guide to Yeast Genetics and Molecular Biology presents, for the first time, a comprehensive compilation of the protocols and procedures that have made Saccharomyces cerevisiae such a facile system for all researchers in molecular and cell biology. Whether you are an established yeast biologist or a newcomer to the field, this volume contains all the up-to-date methods you will need to study "Your Favorite Gene" in yeast. Biochemists, geneticists, molecular and cell biologists, microbiologists, and biotechnologists; graduate and postgraduate students in these disciplines. University of California, San Francisco, U.S.A.